Hundreds of thousands have received a Wordless Walking Stick from the Fellowship of Christian Farmers. Each person getting a walking stick has heard a personal presentation of how to have eternal life. If you’ve never heard this presentation, you can read it right now online by clicking here —> the Gospel. If you’d like to learn more about growing in your faith, please visit our partner website at: www.intervarsity.org. Learn how to grow in your faith by visiting www.intervarsity.org. 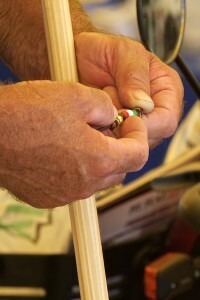 Young and old, men and women all work together to make Walking Sticks that will be used to share Christ with thousands.